Too many of us, in these terrible times, want the happy ending life so adamantly refuses us. We forget there is succor in honesty, as found here. Readers have come to expect memoirs with novelistic arcs: the tough childhood leading to the crisis-inducing middle age, the slow recovery from addiction, confronting abuse, leaving unhappy marriages, the loss of loved ones, until finally, late in life, we get the hard-earned happy ending. 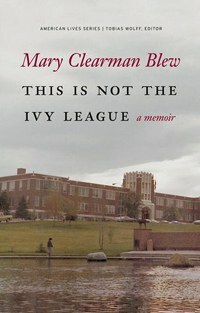 In Mary Clearman Blew’s memoir, This is Not the Ivy League, we’re given the arc, but the ending is qualified. Blew’s life is vastly improved in some regards: she is free of the first husband who tried repressing her intellectual talents, her second husband is dead, and she is alone at night in bed, with her classical music, her book, her glass of whiskey and 400-thread-count sheets. At 71, she is finally economically secure, doing work she loves, on her own terms. But payment for those terms was dear. And all is not well. There is no happy ending. A native of Montana, Blew’s fiction and non-fiction has centered on a rapidly vanishing way of life, that of ranching and farming in Montana and its surrounding environs. Her work unsparingly details a life most urban dwellers will have difficulty understanding. In a time when people are making efforts to live closely with and off the land, to leave a light carbon footprint by returning to sewing, farming, reaping, and canning, Blew’s writing is a bucket of ice water thrown in the face of an urban homesteader’s fantasy. Her descriptions of farming and ranching are unremitting expenditures of hard labor. A woodburning stove needs constant attention, and central heating is nothing to sneeze at when winter temperatures drop to 30 below zero. Plumbing is an outhouse, the bathtub a galvanized steel tub housed in the kitchen. Telephones, televisions, and washing machines lay far in the future. Electricity arrived, finally, after World War Two. When deer nibble your precious gardens, it’s time to fetch the shotgun, hunting season or no, and put venison on the table (saving the heart and liver for family breakfast). Farming is all well and good when the weather cooperates. Unfortunately, it often doesn’t, leaving drought, failed crops, and foreclosure in its wake. Blew had an early proclivity toward reading and writing that, if not actively discouraged, certainly wasn’t supported. Women of her era were expected to be good farm wives; at best, a woman could earn a teaching certificate and find work in one of the rural schoolhouses dotting Montana’s underpopulated landscape. But Blew wasn’t interested in teaching. Instead, she was drawn to puzzling pursuits: theater, Latin class, reading, fiction writing. She insisted on attending college, where her professors recognized her ability. Her family was far from pleased. By 19 she was married, parent of an infant son, and under tremendous pressure to abandon her education and fulfill her womanly role as wife, mother, and housekeeper. Reading about these years is painful. Her first husband literally stood over her typewriter as she wrote, demanding she stop “writing about him”. Her in-laws were relentless, demanding she at remain home, cooking, cleaning, and ironing, which she did, while teaching freshman composition and penning her doctoral dissertation. Even now, in this era of “opting out,” when affluent, college-educated women choose to leave the workforce in favor of raising children, Blew is unable to explain how she kept her home life going—getting dinner on the table, her husband’s shirts ironed—while writing her dissertation. All she can describe is constant exhaustion, punctuated by bouts of heavily depressive sleep. These bold, painful statements defy every writer’s fear of writing about loved ones. To write so openly about your children is to invite... what? The fear that they’ll cease speaking to you? That they'll go mad? Meanwhile, at age 71, Blew is taking care of her adult daughter and that daughter’s toddler, 11 months old at the memoir’s conclusion. Many of us, by then, might wish for a little more peace in their lives. Blew’s two marriages are pointedly described. Her first husband remains nameless. It’s easy to call him a product of an earlier, pre-feminist time, when women living in rural areas were expected to keep house, mind the children, and shut up. Yet these men still exist, everywhere. Blew’s first husband was certain she was having an affair, that every piece of fiction was about him. At first, Blew was compliant: she turned from fiction to academic writing. But when she refused to stay at home, finding employment at Northern Montana College, he left her. Initially devastated, she came to appreciate her freedom. Blew’s second marriage was far happier, at least in the beginning. Bob Blew was not threatened by his wife’s increasing successes until he developed pulmonary fibrosis, an ultimately fatal lung disease he opted to leave untreated. Pulmonary Fibrosis affects blood oxygen levels, which in turn affect the brain. He went from a vibrant man who flew his own plane to a shadow of his former self, who spent much of his time huddled on the couch. He, too, became paranoid about his wife’s activities, and began stalking her on campus. After he hit her, she fled to Idaho, where she took a position at Lewis Clark State College of Idaho. Blew is an wonderful writer whose work has never reached the audience it deserves, and I rather doubt this staunchly honest memoir, despite its magnificence, will remedy this. Too many of us, in these terrible times, want the happy ending life so adamantly refuses us. We forget there is succor in honesty, found here in a true western writer whose limited readership speaks to our limitations, not hers.